In keeping with staying off the computer in my free time, I finished three books this month. I'm going to try to keep a monthly log of the books I read here, but no promises. My rating system will be as follows: three stars for books I love, two stars for books I like, and one star for books that were okay. 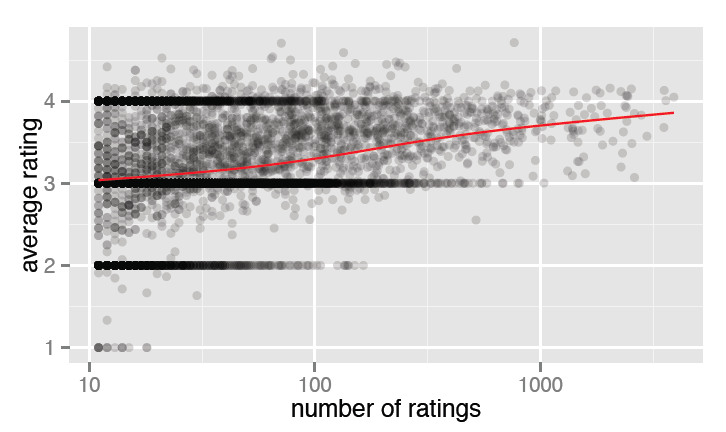 I've worked far too much with user data on a five star scale, and so I know that the five star system is hopelessly skewed--see the plot for an example of some data I use. People like to spend their time reading good books, though, so it would make sense if good books get more ratings. Well, let's take a look. Here's a scatter plot with a smoothed mean. So popular books do tend to get higher ratings, which makes sense, but we still see a bias, since the least popular books still have an average rating of around 3. With my rating system, I'm going to try for more of a bell-curve, giving mostly two stars, and about equal number one-star and three-star ratings. One star books I probably won't recommend to folks, two star books are definitely worth the read, and three star books I might like to read again and will probably push randomly on friends. Anyway, on to the books! For January, there was an accidental theme of poverty in all of them that made me want to tighten my belt and always be grateful. A Christmas gift that had been on my to-read list for a while, this nonfiction about a Mumbai slum made me want to donate more. While there was somewhat of a story arc, it was more about seeing a slice of reality in abundant detail. A $1 purchase at the library's used book store, this has been one of my favorite reads in a long while. (Mark Helprin is one of my favorite authors, despite my critique of Digital Barbarism that I'll probably never finish.) This book involves a royal couple needing to struggle for survival in America, and it's a staggering trip to go from champagne to homelessness. There's fantastic distortion of reality, beautiful language, and a tenderness that simply made my soul feel full. This classic book sat squarely between the two others in both realism and degree of poverty. There's a Cinderella-like quality to the book, and I'm always a sucker for both reader-girl protagonists and Cinderella stories.